We’re thrilled to partner with Waukesha Reads again to unite the community through great books! 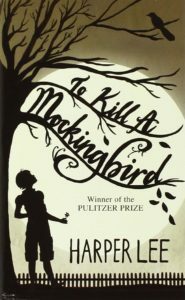 As part of the NEA’s Big Read, Waukesha Reads invites community members to read (or re-read) To Kill a Mockingbird by Harper Lee and then explore the book through discussions, performances, and community events running September 30 – November 13. Ex Fabula, as in the last 3 years, will present a Storytelling workshop and a StorySlam that explore one of the book’s themes – which will be “Loss of Innocence”. Not sure if you have a story? Don’t worry – we’ll help you find it and share it through these events. Saturday, October 22, 10:00 a.m. – 12:00 p.m.
Everyone has a story to tell. Are you thinking of telling a story at the upcoming StorySlam? Are you interested in storytelling but prefer to start with a smaller audience? Join us for a special “Loss of Innocence” themed storytelling workshop. An Ex Fabula coach will guide you through exercises to help you find, structure, practice and share a true, personal story. Ages 13 and up. FREE. This Slam will feature true, personal stories on the theme of “Loss of Innocence”. Come just to listen, share your story without getting on stage by writing an UltraShort, or throw your name in the hat and then take the stage. Stories must be 5 minutes or less, told without notes or props – just the elements of “Story. Stage. You.” Ages 13 and up. FREE. Read about last year’s Coming of Age Slam, inspired by The Wizard of Earthsea by Ursula K. LeGuin. Visit the Waukesha Reads website to learn more about “Why should Waukesha read” and to see the full calendar of events.